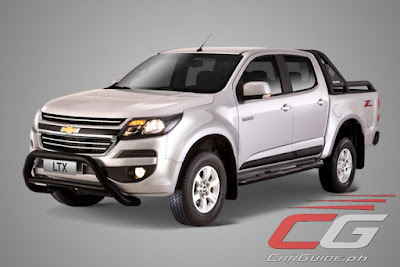 Taking its cue from the recently launched 2017 Trailblazer LTX, The Covenant Car Company, Inc. (Chevrolet Philippines) is introducing a new variant of its Colorado pickup truck which marries a tough new style with unmatched capability. Meet the 2017 Colorado LTX. Mechanically, the Colorado LTX remains unchanged and that means it is powered by the 2.8-liter Duramax 4-cylinder turbo diesel engine that yields class-leading numbers of 200 horsepower and 500 Nm of torque. The Colorado LTX, like the rest of its brethren can carry 1-ton on its bed, tow 3.5 tons, and traverse water reaching 800 millimeters. Outside, the Colorado LTX differentiates itself with several exterior enhancements that highlight robustness. Made from powder-coated 3-inch steel tubing, the matte black roll bar with horizontal tie-down bars gives both form and function to the Colorado. It draws attention to the truck’s tough stance while providing a mounting point for accessories and anchorage for securing gear and cargo. It also houses the 3rd high-mounted brake lamp for visibility and safety. Enhancing the rugged visage of the Chevrolet Colorado is the 3-inch tube steel nudge bar that lends additional protection in minor frontal impacts and serves as a mounting point for lighting accessories. The LTX variant has 3-inch steel tube step-assist to protect the vehicle from potential damage to its door sills and lower door panels from rocks and debris. They also ease ingress and egress of passengers into and out of the tall Colorado LTX. The matte black B-pillars then give the sporty appearance of a long flowing window line, endowing the new Chevrolet Colorado LTX with irrefutable masculine appeal. Inside, the new Chevrolet Colorado LTX comes with jet-black leather seats with light gray stitching, perforated seat cushions, and backrests for increased driving comfort in warm weather. The side bolsters are finished in hard-wearing smooth leather that gives the interior a complete premium feel. The Colorado LTX features jet-black leather-wrapped steering wheel and door panel inserts with light gray stitching. Its gear knob and center console are laminated with cubic print lamination that complement the color, texture, and patterns of the pickup truck’s interior. Adding to its generous interior space are discreet pockets placed at the leading edge of the driver’s and passenger’s seats – perfect for keeping small loose items away from prying eyes. In terms of safety and convenience, the new Chevrolet Colorado LTX variant comes with a chromatic rear view mirror that darkens or lightens the mirror, as light condition requires. It is also fitted with an HD in-dash camera that records looping video in a 32 GB memory card – a first-in-its-class feature in the pickup segment. The front-facing dash camera provides additional safety on the road as it records unforeseen mishaps or other events when driving. audible warnings when reversing in tight spaces. The in-dash camera, reversing camera and rear park assist top view are displayed on a 4.3-inch LCD monitor placed in the rear view mirror for convenient viewing when driving and parking. The Colorado 4x2 LTX is backed up by the Chevrolet Complete Care Program for a truly worry-free ownership experience. The Colorado LTX comes with a special 5-year warranty coverage: 3-year bumper to bumper warranty plus a 2-year warranty on the powertrain or 100,000 kilometer, whichever comes first. Chevrolet owners are automatically enrolled in the 24/7 Chevrolet Emergency Roadside Support for 3 years, with an option to renew on the 4th year of ownership. They are also given access to 24/7 Customer Care Hotline and are guaranteed one-hour express service for select services and non-stop service in select service centers. The new Chevrolet Colorado LTX is now available in all authorized Chevrolet dealerships nationwide at a price of P 1,387,888.